This book is difficult to put into any specific genre. There are elements of fantasy and horror all intertwined in a psychological mystery. I am always drawn to books with unique themes, and I found Pseudotooth achieved this admirably. It was an engrossing read that kept me guessing until the final pages. Multiple themes intertwine through this tale, including finding oneself, despite hardship and feeling unloved and unlovely. Early in the story there’s a piece of information given by Holloway that hints at a deeper, more tragic event in Aisling Selkirk’s young life that provides the rationale for Aisling’s mental instability, and which without the story would not unfold as it does. Psychological and physical trauma and how individuals either succumb or conquer it is the overarching theme for the all the major characters. Seventeen-year-old Aisling has been suffering from blackouts and has had troubles eating for the past three years. I was delighted that Holloway didn’t go into too much detail of disorders and the clinical consequences and focused more on their emotional impact. Holloway writes from the point of view of a person suffering from the symptoms of bullying, lack of love, and parental abuse. As a reader, I had an immediate attachment to the character and wanted to know how she fared. The story quickly became intriguing. The opening pages provided an integrated back-story as Aisling watched the East Anglia countryside slip by while being driven by her mother to a distant Great-Aunts house. The description of the drive delivered the scene convincingly, as did Aisling’s internal discourse about her feelings on her supposed ailments. Aisling’s disappointment and distrust of her mother, Beverly, was brought to light in a disturbing fashion. Cautiously, Aisling enters the old two-story Tudor vicarage unaware that it no longer attaches to an active church. Anxiety coursing through her, she encounters her icy and controlling Aunt who immediately confiscates the only source of comfort Aisling had, a book of William Blake’s poems. William Blake’s book of poems is a constant companion throughout the novel. Blake was considered insane and was largely disregarded by his peers during his lifetime, although now is considered one of the great Romantic poets. He had spiritual visions and his collection, Songs of Experience, contain an expression of adult corruption and repression that reflect Aisling’s own experiences. Stanzas of specific poems are used to enhance the feeling of strangeness and suggest that all Aisling sees and does may not be real. In life, many people hang onto iconic items that mean something to them as a totem of luck or for memories. 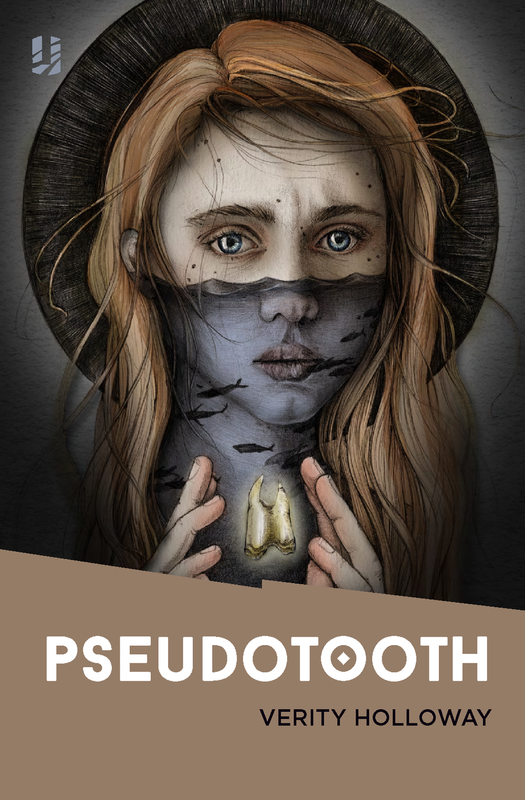 The name of the book, Pseudotooth, is a reference to both the supposed pseudo-seizures and a tooth that Aisling obtains during a “sighting” of a ghost in the hallway of the vicarage. This tooth becomes her totem, as it resides in her pocket for most of the book. Then there is also the mystery of the emerald cufflinks that belonged to the Aunt’s beloved vicar father. These items are as essential to the story as much as the main characters themselves, reappearing throughout and leaving questions in the readers’ mind about their significance and whether Aisling’s experiences are what they appear or are misinterpretations of reality. Aisling is a complex character. I really appreciated that Holloway remained true to the traumas and consequences in Aisling’s life, and that she didn’t give in to the easy fixes such as letting Aisling’s medication be a reason for her so-called visions, or giving her a “champion” to rely on. From the beginning, we get snippets of Aisling’s diary and the story of Feodor—another broken young man, and, again, it’s unclear if he’s real or simply a creation of Aisling’s illness. He loves fire and has violent tendencies. Whether he’s real or not, he is an important character whose true intentions don’t emerge for some time. The only scrap of information readers get of his story are piecemeal journal entries that continue well into the narrative. His character certainly provides ambiguity and intrigue in Aisling’s state of mind. We also meet Chase, a Puck-like character who initially draws Aisling away from the Tudor vicarage and offers her refuge, even before he knows her story. Aisling refuses despite being attracted to his offer. It is not long before she meets him again. As she finally escapes the vicarage, she awakes in a dilapidated town where Chase finds her and leads her to Tor, an old woman who lives in a small vale where Aisling finds a modicum of happiness and peace. At least until she understands that the vale is as much a prison as the vicarage. It is here where Feodor’s story again impacts Aisling’s life. Holloway’s writing is sure and inventive; her language choices interesting yet clear. The opening description of the countryside is what I would term “bloated,” and I wondered if the use of descriptive adjectives would interfere with the storyline. Luckily it lasted less than a page. I was often entertained by some unusual imagery used when describing Aisling’s reactions. They targeted both the emotional and physical aspect of Aisling’s situation. Holloway describes Aisling’s penchant for quoting Blake’s poems as a “rock-a-bye instinct,” like the comfort of quoting nursery rhymes. As a reader, I was wholly in tune with Aisling’s character. The change of setting was subtle throughout the book. In fact, so subtle that neither Aisling nor the reader knows whether the change is real or imagined, as it seems to occur during stress that leads to her having a seizure or blackout. If there’s one thing that I wasn’t enamoured of, it was that it took until almost the last two chapters to truly understand what was and wasn’t real. Yet in hindsight, it was necessary for the story and the character growth. And it kept me reading to find out. I found myself looking up William Blake, the East Anglia countryside, and, surprisingly, pseudo-seizures after I finished reading. Holloway integrates the oftentimes harsh reality of the real world using Aisling and Feodor’s childhood experiences with the “other” world that mimics the English countryside yet has its own twisted history; one influenced heavily by the psychology of a sick man. In such a setting, the unexpected can occur. Throughout the book you expect Aisling to become stronger, to understand her issues, and to ultimately be cured. Yet Holloway does not give in to that expectation. A cure for Aisling’s issues is not that easy, but a way to a cure may be—as in real-life.